Knock down the four animal figures and then hit the centre disc to standthem back up. Catches pellets and avoids ricochets. 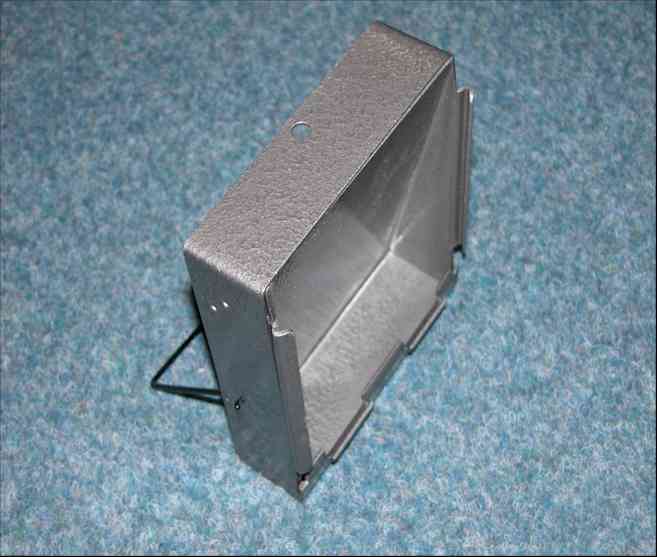 Post or wall mount target pellet trap, designed to fit on a post or wall the trap takes standard card targets. The pellets are again caught inside the trap. 150x150x180mm. Daisy's Sound Blaster Target is just the thing for beginning shooters. It provides "immediate gratification" and gets them outside for some enjoyment of the great outdoors. Four different sounds immediately let the shooter know they hit the target. 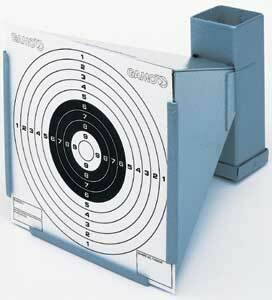 This fun target, paired with a Daisy Red Ryder or any BB gun will provide hours of shooting fun. The interactive package lets you hear the sounds before you buy. 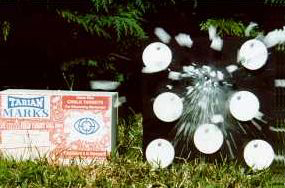 This target is recommended for use with airguns with a velocity of 350 fps or less. Great for use with Daisy Powerline Slingshots too! 'Tarian Marks' chalk targets are very easy to use. 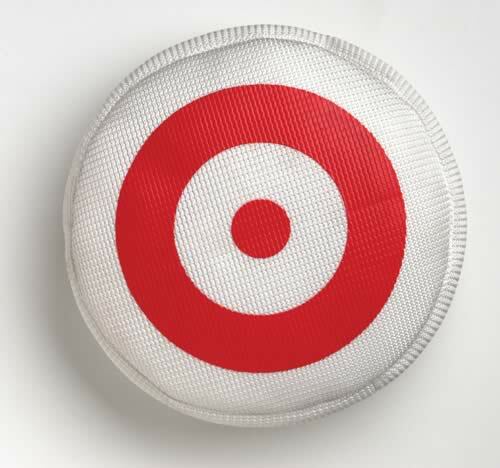 Each target has a small hole cast in it to enable it to be hung up. 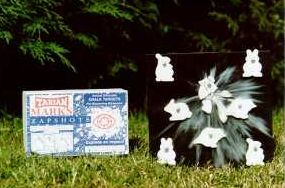 Firearms Shooters use a dark cardboard backing with the chalks pinned to it using small nails, match sticks or cotton buds. The 45mm (approx. 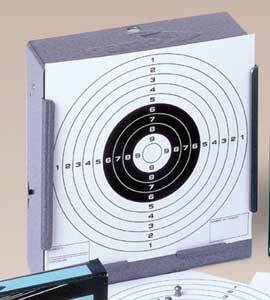 13/4 inch) Targets are about the size of the "kill zone" of the field target knockdowns. They are excellent targets for close range CO2 pistols and at longer range for air rifles, 22 semi-auto rimfire and full bore gallery rifles. 84 to a pack. The 24mm (approx. 1 inch) is the smallest Tarian Marks and is ideal on short ranges (or very good shots). Man Vs Man Speedshoots or funshoots. 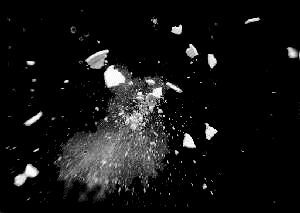 240 chalk targets to a pack. Also featuring heavy steel construction, Gamo´s Cone Pellet Trap safely and effectively deflects all lead pellets into a rear compartment. 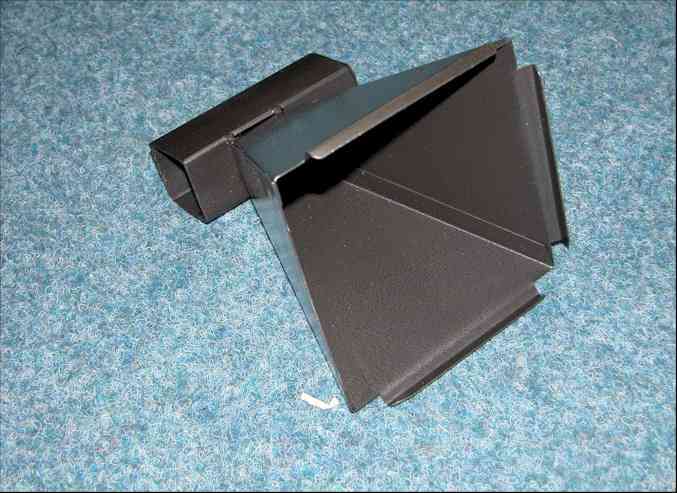 This pellet trap can also be used hung from the wall or free-standing and will accept all standard 51/2" x 51/2" target cards. For safe target pratice with pellet rifles and pellet pistols indoors or outdoors, this ultra-compact, yet incredibly sturdy, pellet trap features all-steel construction that will stand up to years of continuous use. Measuring only 53/4" wide x 6" high x 2" deep, the Gamo Flat Pellet Trap accepts all standard 51/2" x 51/2" ten-meter target cards and can be used free-standing or hung from the wall. Gamo´s new Rocker Pellet Trap introduces a new level of clean, safe fun to any adult airgun plinking activity, indoors or outdoors. Featuring the same steel construction of our other pellet traps, this model incorporates five individual swinging targets that disappear when they are hit: two outside 1" discs flanking two 3/4" discs and, at the center, a 11/4" square. When the one in the center is hit, the discs are automatically reset. 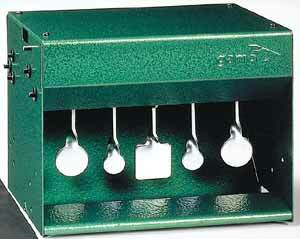 The Rocker Pellet Trap is also incredibly compact, measuring only 8" wide x 6 1/4" high x 63/8" deep. To have an efficient pellet trap, use with air rifles that produce muzzle velocity of less than 825 fps. 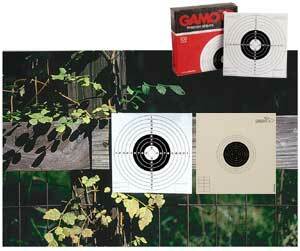 GAMO covers all air gun shooter needs with a complete range of accessories that includes a great selection of standard 51/2" x 51/2" target cards. 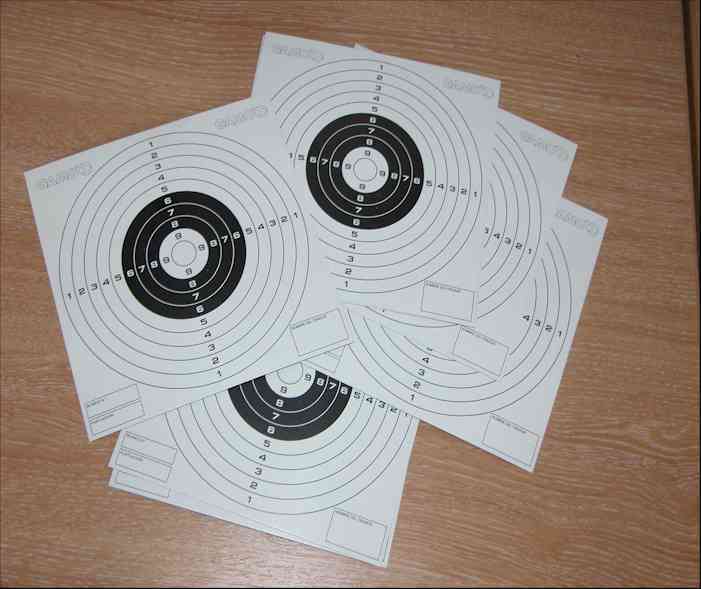 These include traditional bull's-eye targets, professional targets, as well as assorted cards depicting four different target figures for those shooters who prefer more variety. All of these are printed in heavy, easy-to-score paper and come packaged fifty or one hundred cards per box.